04-09-2017 - Stronger Bacteria. Weaker Antimicrobial. 1000000 deaths in EU by 2050. Monday, 4 September, 16:00 -18:00, meeting room Altiero Spinelli 5E-2. Antimicrobial resistance (AMR) is a complex issue of global concern. 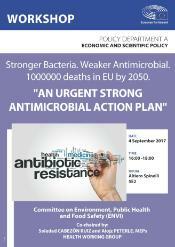 With the aim of discussing the main challenges related to this topic, the European Parliament’s Committee of Environment, Public Health and Food Safety (ENVI) is holding a workshop on 26 June 2017 (16:00 - 18:00) in ASP 1E-2, on the “Stronger Bacteria. Weaker Antimicrobial. 1000000 deaths in EU by 2050. "An Urgent Strong Antimicrobial Action Plan"”. The workshop will be hosted by Ms Soledad CABEZÓN RUIZ (MEP) and Mr Alojz PETERLE (MEP) Co-chairs of the Health Working Group within the ENVI Committee. Please note that while the workshop is in principle open to the public, you need to have access to the European Parliament to be able to attend. (No special registration for the workshop available). Agenda - Stronger Bacteria. Weaker Antimicrobial. 1000000 deaths in EU by 2050.